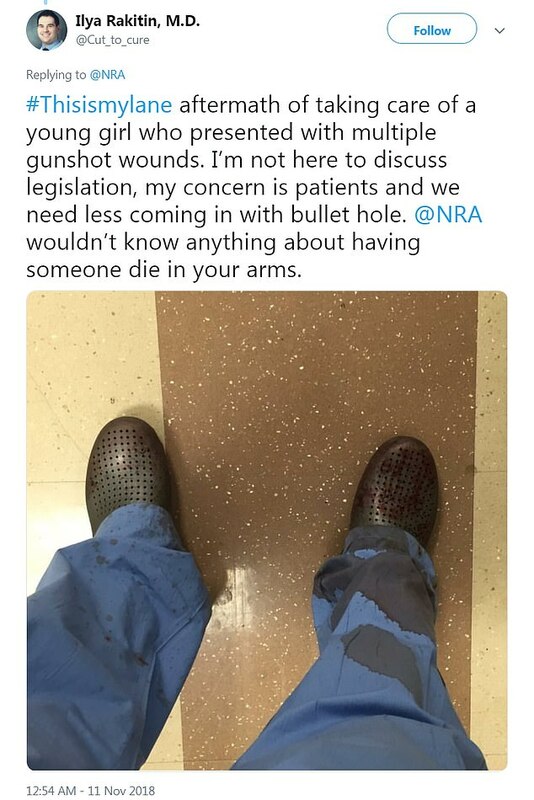 A doctor has shared a gruesome photo of her scrubs covered in blood to hit back at the National Rifle Association's claim that doctors should 'stay in their lane'. 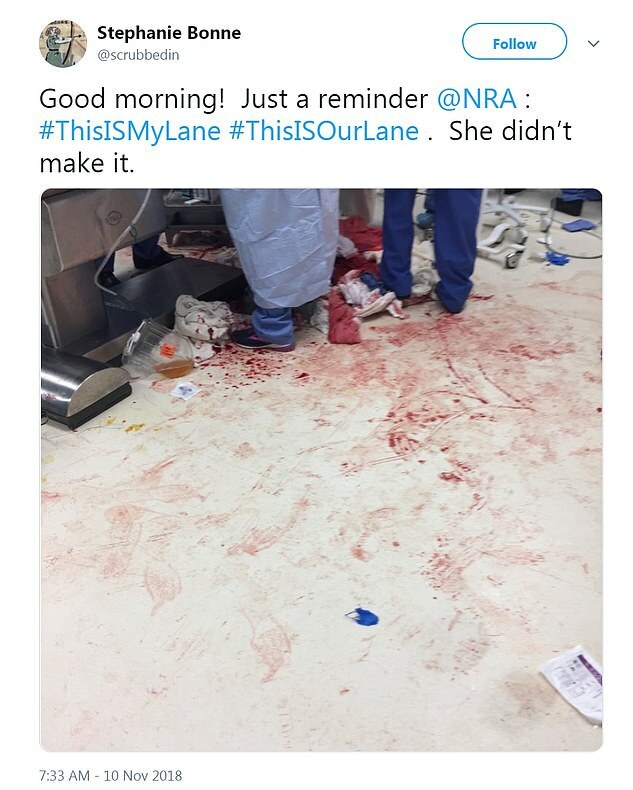 Dr Kristin Gee, of Los Angeles, posted a picture of her pants and shoes drenched in a gunshot victim's blood, writing: 'To the @NRA, this is what it looks like to stay in #mylane'. 'We will not be silent about the toll of #gunviolence,' she added. 'I speak out for this patient, for their parents who will never be the same, for every person who came after this one and didn't have to #thisiseveryoneslane'. 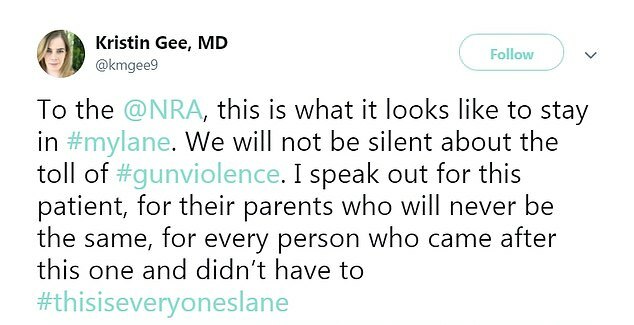 Gee is just one of many physicians who spoke out after the NRA tweeted a new blog post against 'anti-gun doctors' on Wednesday, just hours before 12 people were murdered during a mass shooting at a Los Angeles country bar. 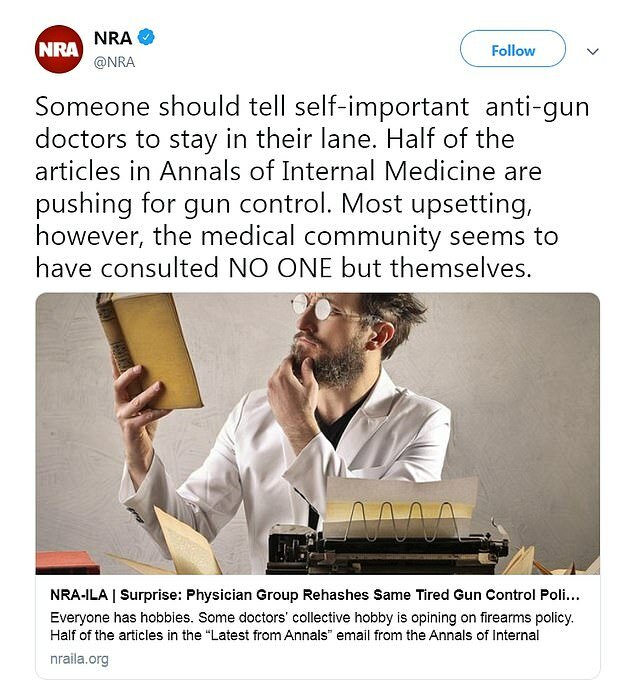 'Someone should tell self-important anti-gun doctors to stay in their lane,' the official NRA Twitter wrote in the caption alongside the blog post. 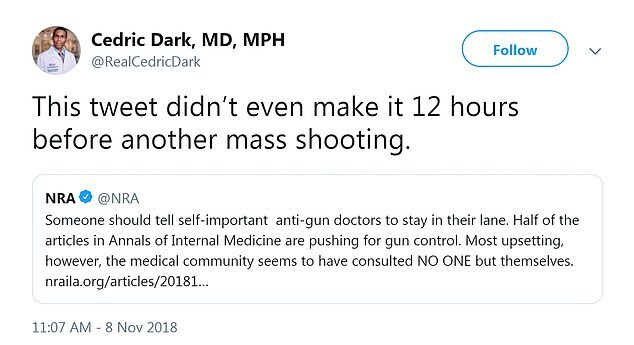 The tweet hit a nerve with doctors, who set out to prove that they are the exact people who should be consulted when it comes to gun violence. 'Do you have any idea how many bullets I pull out of corpses weekly? This isn't just my lane. 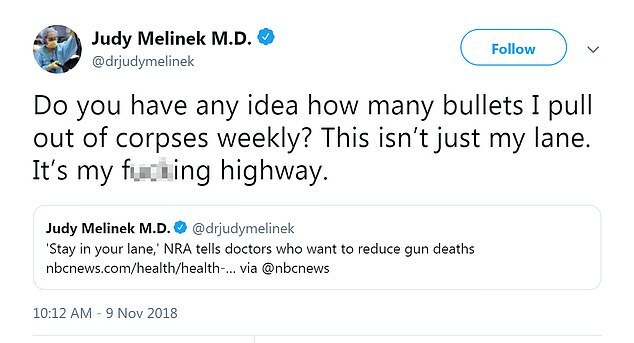 It's my f*****g highway,' wrote forensic pathologist Dr Judy Melinek. 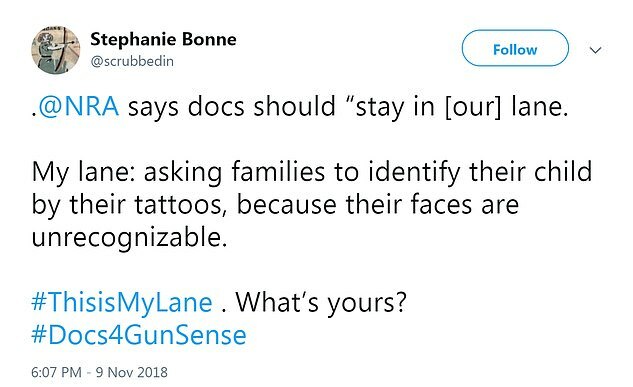 'My lane: asking families to identify their child by their tattoos, because their faces are unrecognizable,' added trauma surgeon Dr Stephanie Bonne. 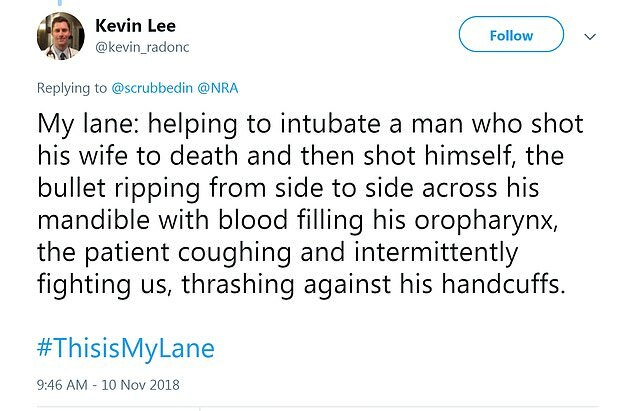 'My lane: helping to intubate a man who shot his wife to death and then shot himself,' wrote Dr Kevin Lee. 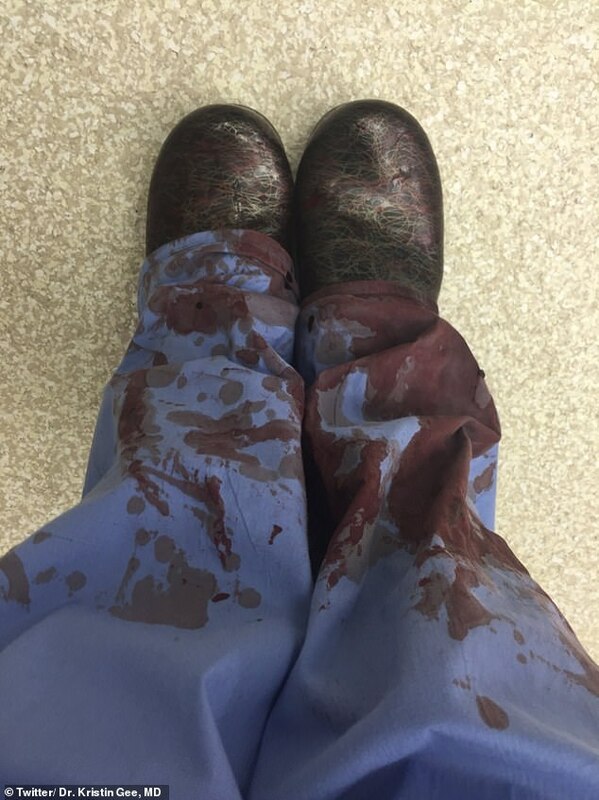 Dr Ilya Ratkin, a general surgery resident in Detroit, also shared a picture of his scrubs covered in blood. '#Thisismylane aftermath of taking care of a young girl who presented with multiple gunshot wounds,' he wrote. Dr Nuriel Moghavem shared an X-ray of a gunshot victim and wrote: 'My lane is making sure people don't die, and you're in the way'. 'I helped save a gun violence victim in med school. Those are my hands holding pressure on his femoral artery so that he wouldn't bleed to death,' he added. Dr Rick Sidwell, a trauma surgeon, also tweeted his support despite the fact that he is also an NRA member and gun owner. 'I'm an @NRA member. I'm a #gunowner. I'm a caring trauma surgeon who is trying to be part of the solution, working with @ACSTrauma,' he wrote. 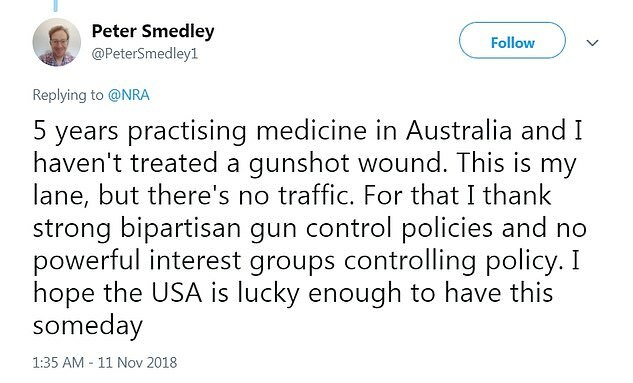 Peter Smedley, an Australian doctor who has been practicing medicine for five years, also spoke out. 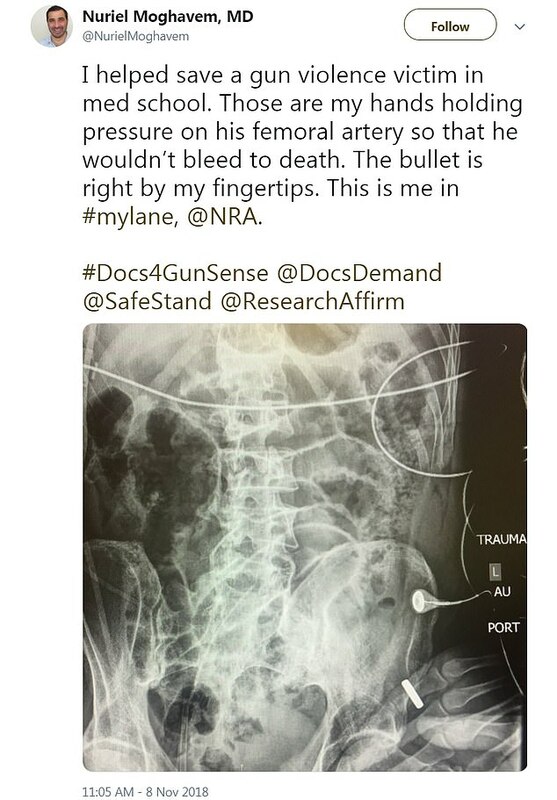 The NRA's tweet was in response to a new article published in the Annals of Internal Medicine titled 'Reducing Firearm Injuries and Deaths in the United States: A Position Paper From the American College of Physicians'. In the article, the American College of Physicians provide a slew of recommendations - for doctors and lawmakers - that they believe can help combat America's rampant gun violence. Recommendations include training doctors in firearms injury prevention and counseling patients on the 'risk of having firearms in the home'. 'The medical profession has a special responsibility to speak out on prevention of firearm-related injuries and deaths, just as physicians have spoken out on other public health issues,' the paper reads. The American College of Physicians also states its support for 'appropriate regulation of the purchase of legal firearms' in America, including universal background checks, educational programs on firearms safety, and restricting firearm access to domestic violence offenders. While the NRA's tweet received a mountain of criticism, the organization appeared unfazed. 'It's just another example of gun control advocates with the help of the mainstream media blaming law abiding gun owners for the criminal acts of deranged people and exploiting tragedy to push a gun control agenda that would not prevent these crimes,' NRA spokeswoman Jennifer Baker told CNN. 'The gun control policies they advocate for are already the law in California and they did not prevent tragedy,' she added, referring to last week's massacre at Borderline. But Bob Doherty, the SVP of the American College of Physicians, said the responses to the NRA's tweet showed it was clear Americans wanted something to change.